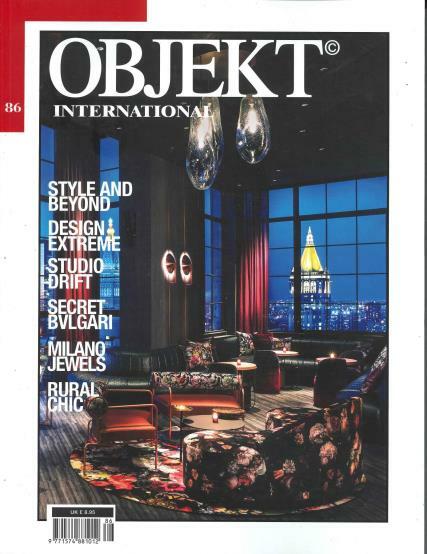 Objekt International UK is the leading magazine of the world for interior designing. The magazine thrives to provide best of the architectural structures for modern upscale people. Buy a single copy or subscription to Objekt International UK magazine. Homes are the place where happiness dwells and various architectural solutions provided in the Objekt International UK magazine would make it happier and a better place to live in. The featured designs offer a perfect blend of classical and modern intricacies to suit every décor and ambience. The premium Objekt International UK magazine has top suggestions and design idea from top interior designers and architects. You may be an antique lover or a modern style passionate, whatever may be your liking, Objekt International UK magazine would surely have a something to match your taste. The transformations and the ideas suggested in the magazines are very practical and most workable. Featured in the magazine are the incredible tips and ideas to have happily organized kitchen, lush green gardens or landscapes, luxurious bathrooms and beautiful living and bedrooms. The Objekt International UK magazine has news and updates to keep you informed about the latest developments in the world of interior designing and furnishing. The featured articles and interviews of the top architectures and interior designers are very inspiring to have you experimenting with new ideas. The magazine also has details of the antique furniture and arty crafts that can enhance the look of any room instantly. The Objekt International UK magazine features some of the architectural master pieces. The high quality glossy pictures would accompany some very innovative ideas and designs. Get the Objekt International UK magazine subscribed today if you have an avid eye to identify and appreciate distinguished designs and details. The subscription to the Objekt International magazine is cost effective and would get each issue of the magazine conveniently delivered to you as soon as it is released.